After you stock the SkyDrive app with files, you can access those files quickly and easily from your Windows 8 tablet’s SkyDrive app. Can’t find your tablet’s SkyDrive app? Download it for free from Microsoft’s Store app. 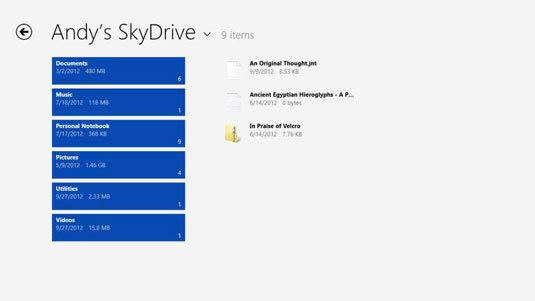 The SkyDrive app fills the screen, showing all of your folders and files uploaded to your SkyDrive account. Although they’re the same folders and files, the app shows them in a slightly different style. If the SkyDrive app doesn’t show your files, make sure you’re connected to the Internet; otherwise, you can’t connect to SkyDrive. Tap what you want to open. Tap a file, and a program appears to show the file’s contents and let you view or edit it. If a file doesn’t open, you don’t have a program or app on your tablet that’s capable of opening the file. Refresh: Tap this to tell SkyDrive to refresh its list of files and folders, which is handy if you’re waiting for something to be uploaded from another computer. Upload: Covered in this section, this option lets you choose files to store on SkyDrive.